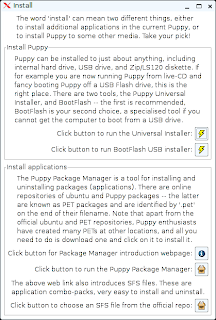 Unlike most versions of Linux you do not need to install Puppy Linux. It actually runs perfectly well from a USB drive. Simply plug in the USB drive and wait for the system to boot up. If the computer boots straight into your existing operating system then you will need to change the boot order of your PC to boot from a USB drive before the hard drive. (Alternatively install the Puppy ISO to a CD and boot from the CD as they are always set to boot before the hard drive, if that is not the case follow this link which shows how to change the boot order). Once you have booted into Puppy for the first time the following screen will be shown. In the centre of the screen is the quick setup wizard. From this screen you should set your country of residence, your timezone and keyboard layout. You will also see the current screen resolution that has been selected. The next screen that appears gives you the option to set up your internet connection and provides information about saving your session. 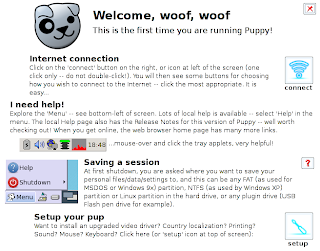 Puppy Linux generally runs from memory but all your files such as pictures and music will need to be stored somewhere and so Puppy Linux gives you the option to create a save file on the hard drive of the computer you are running on within the operating system that resides on the computer. I recommend rebooting straight away as this will give you the option of creating the save file. You can give the file any name you choose and specify the drive you wish to save the file on. To set up an internet connection click the connect icon on the desktop. The internet connection wizard will load. 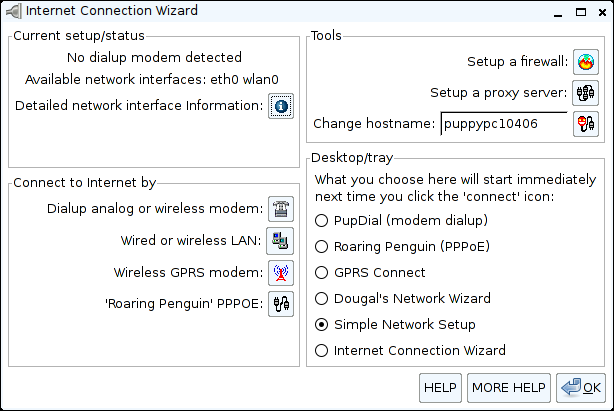 There are a number of different options available for connecting to the internet but I found the Simple Network Setup option to be perfectly adequate in setting up my connection. 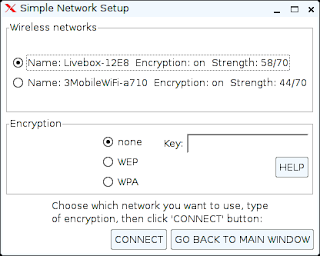 The Simple Network Setup tool will give you a list of all the potential network options. As you can see I have an ethernet connection and a wireless card. 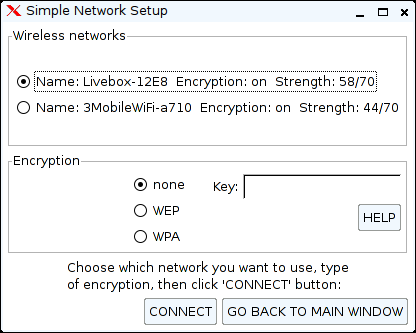 Clicking on the WLAN0 button brings up a list of networks that I can connect to. To connect to a network all that I had to do was select the name of the network and enter the security key. The browser that comes with Puppy is Seamonkey which is a lightweight browser. 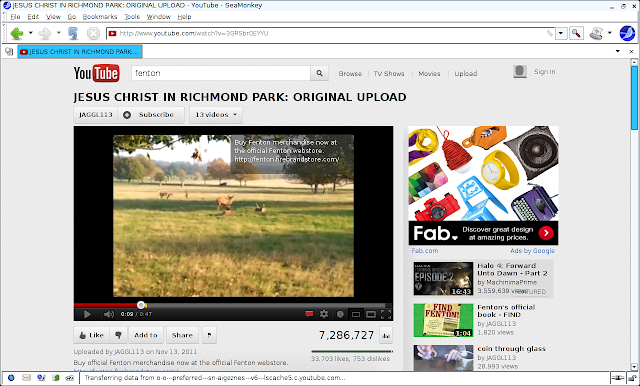 The first thing I do when I use a new distribution is to go to Youtube and attempt to watch a video. This lets me know instantly if I am going to have any problems with running Flash. I am pleased to announce that Flash works fine within Precise Puppy as can be seen in the image above. 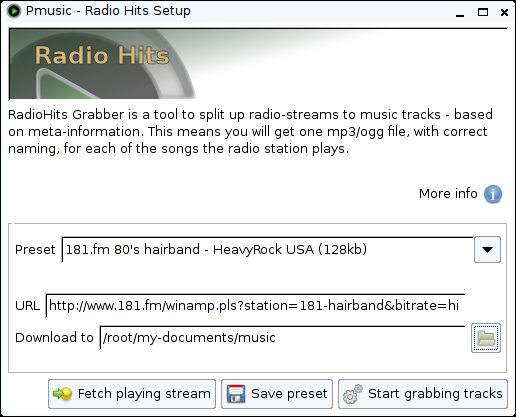 Another good test when I use a new version of Linux is to run the default music player and attempt to play MP3 files. The default player within Precise Puppy is PMusic. Before I say whether it can play MP3s or not I just want to say “WOW”. I really like this tool. Visually the tool isn’t spectacular but it has some neat little tricks that had me playing with it for ages. Firstly when you start the application it starts playing music straight away by connecting to an online radio station. If you want to listen to different music click the music sources menu and you can choose from a list of sources including CDs, local media, radio stations, web hits and podcasts. Clicking the radio stations setup link gives you the option of installing an index of online radio stations. Once the list is downloaded you can access an incredibly large list of radio stations. You can search the radio station list by category or by country. The secret gem within Pmusic is the Radio Hits Setup screen. Simply choose a preset radio station and a path to download to and then click to start grabbing tracks. 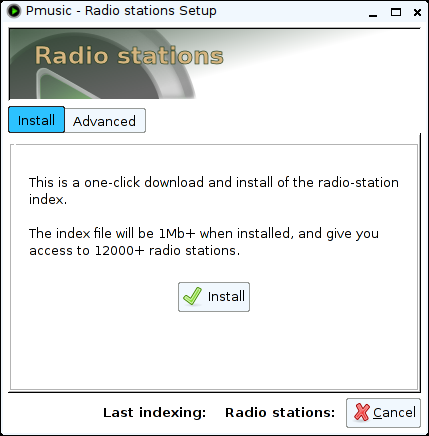 The tool will download songs from the selected radio station in MP3 format. The neat thing about the tool is that it ignores adverts and only downloads complete tracks. 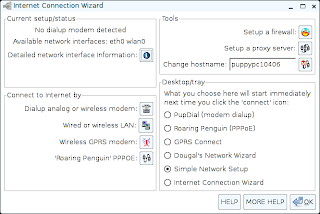 Puppy Linux has always impressed me with the sheer number of great tools that are available that are pretty much unique to Puppy installs. There are far too many applications installed to list them all here but what needs to be mentioned is that all of them are designed to be lightweight. There is no LibreOffice and no GIMP. Remember that Puppy is designed to run from memory therefore it doesn’t make sense to have resource hungry applications installed by default. 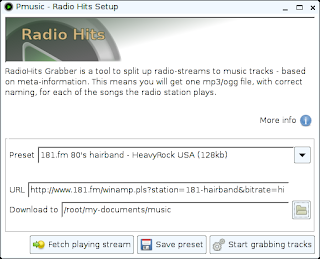 I have already mentioned the great PMusic tool for playing music but Puppy Linux comes with other good tools such as mtPaint which is an image editing application, Abiword for basic word processing, the brilliant Geany editor and a host of tools for ripping music. 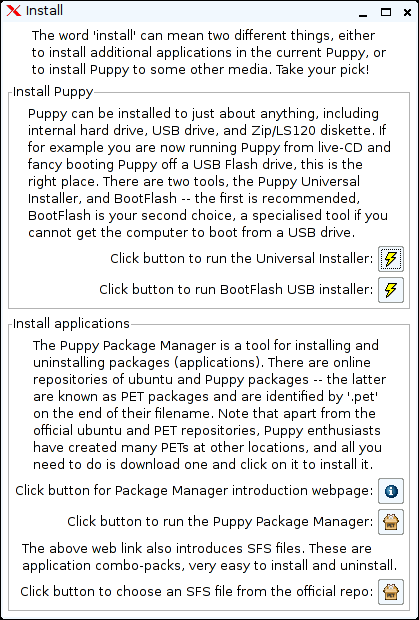 There are also tools available which enable you to create your own version of Puppy and burn it to USB. We all have applications that we just can’t live without or just prefer. In my case I like Chromium and although Seamonkey generally works it isn’t as good as Chromium. To install software click the Install icon on the desktop. Now the screen that appears gives a lot of options. To break the options down the screen is basically split in two halves. The first half of the screen deals with installing Puppy to either a USB or hard drive. The second half of the screen deals with installing applications from the repository. There are two ways to install applications. The first and most common way is to run the package manager. The second is to install an SFS file. The package manager works pretty much the same as most package managers. Enter the name of the package you want to find and then click go. After clicking go a message appears asking if you want to search the selected repository or all repositories. Once you have found the program you wish to install just click on it and the installation will begin. You will be asked whether you want to install just the selected application or to examine dependencies. 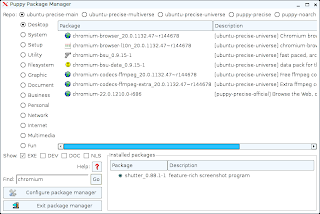 If you choose to examine dependencies a further screen will be displayed asking whether you want to install the selected dependencies or all dependencies. 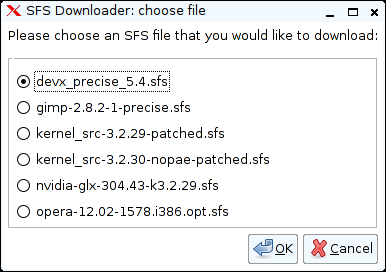 For some applications you can choose to install an SFS file instead of searching the package manager. 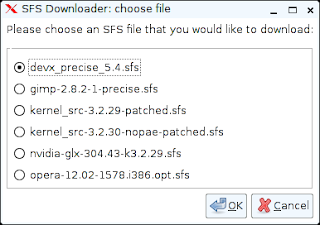 The SFS downloader contains various options including GIMP, NVidia drives and the Opera web browser. Simply choose the file you wish to install and click OK.
You are then giving a list of download locations from which to install from. 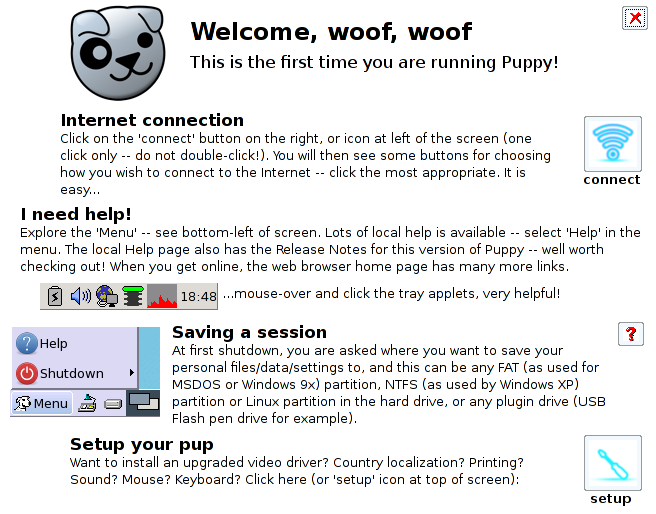 The Puppy desktop itself consists of a taskbar at the bottom with a menu and system tray. There are also a carefully selected list of icons on the desktop. The first row of icons provides a icons for system related tasks such as installing software and mounting drives. The second row of icons are for productivity such as word processing, spreadsheets and image editing. The third row of icons are for connectivity including browsing the web, email and chat. The fourth row of icons gives access to a calendar and the music player. The fifth row has only one icon which is for connecting to the internet. 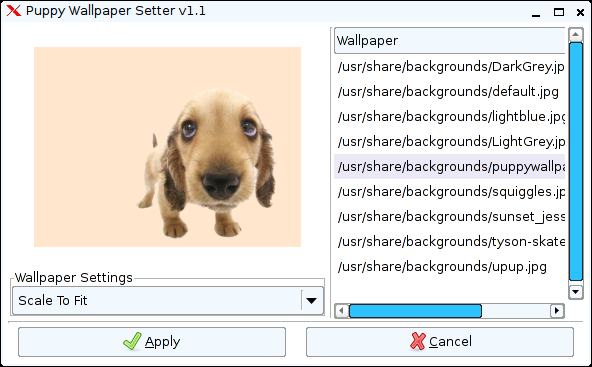 If you want to change the background wallpaper it will come as no surprise that there is a special tool written for this purpose that is unique to Puppy Linux. 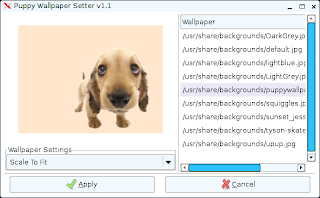 The Puppy Wallpaper Setter provides a list of about 10 wallpapers to choose from. You can install more by downloading them from the web and placing them in the /usr/share/backgrounds folder. Puppy Linux is truly unique in so many ways. It runs from memory, It is designed to run from a USB drive as opposed to just providing a live version and It has its own installer, package manager and suite of clever tools. The boot time is quick even on the older Samsung R20 hardware that I am running it on. (I also tried it on a Toshiba Satellite L870 laptop which has an I5 processor and 8gb of ram and it was phenomenally quick). I have reviewed a number of Puppy Linux releases and this along with MacPup is the most complete and thought out release yet. 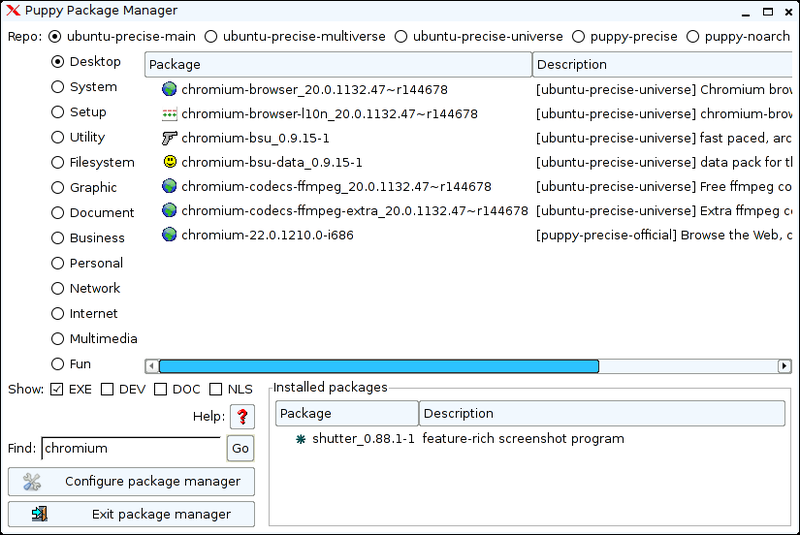 Precise Puppy is linked to the Ubuntu 12.04 repositories so the software available is more up to date than it has ever been. I always keep a version of Puppy Linux on a pen drive and carry it with me wherever I go. This release is thoroughly recommended. very helpful review, thank you! I have been using Slacko 5.3.1 but flash never works so i look fwd to this feature on PP. A long time windows user and find these puppy distros so refreshing and lite. I ran Precise Puppy and installed Chromium and Google Chrome. When you try to run them they both say that you can't run them as "root" (administrator). I hear that there's a new option for running with fewer priviledges as a "fido" user. How do I do that or is there another way to run Chromium or Chrome as "root"? Open a terminal window and enter chromium-browser –user-data-dir. Note that you should not use this solution for any other version of Linux. it is not advisable to run Chromium as an administrator. In Puppy it is slightly different because everything is run as administrator and because of the way Puppy works it is ok. Thanks Gary – the terminal window approach works great. I've been using it for a while now since you suggested it. I just tried this… it doesnt work. Just pops up the same error window telling me I cant use it with a root. This is the kind of crap that makes me constantly go back to windows. Thanks for a helpful review. I've had a glitch or two with audio volume on my puppy installation, but I plan to solve that and learn more about Precise Puppy. Puppy's insistence on running everything as root is what keeps me (and others) from using it seriously. Handy tool, but no good as a standard desktop. Well, its a big improvement over Slacko 5.3.1 as the above commented, but no matter what puppy distro i use i keep getting a error: script not responding, and the laptop just cycles endlessly until i turn it off and reboot, so frustrating. I think maybe it's the flash content still or something because some webpages are ok but others just sends it searching cd/hdd forever. Now my computer is old (2003) but seems to handle everything but this SCRIPT NOT RESPONDING thingy. Does anyone know why? Is there a fix other than buying a new updated computer? As a total Linux newbie utterly frustrated with Windows several years ago, I turned to Puppy Linux when my WinXP Thinkpad's OS got hopelessly corrupted, wouldn't boot and even multiple attempts at repairs/re-installs didn't work. I needed to wipe the HD, re-install WinXP, and start over from scratch but I needed a decent UI to get my stuff off it first as quickly and easily as possible. So I created a Puppy USB boot drive and booted into it. I liked what I saw and used so much, I never wiped the HD and never reinstalled WinXP. I just kept using Puppy. Years later now, out of my 3 home computers, 2 dual boot Linux/Windows, and I almost never use Windows (the other is a Mac, actually BSD Linux anyway). I have Puppy to thank for a non-intimidating introduction to Linux that led me down the road to leaving Microsoft and Windows behind; I use them only when forced to for documents in MS Office (which is actually pretty rare). I was already a big fan of OSS, Puppy just gave me that extra push. And even though I use Ubuntu now, I wouldn't hesitate to recommend Puppy to other newbies eager to learn, and I still keep a Puppy USB drive handy because occasionally I still need it or find it useful to help friends' whose Win PCs are screwed up. Yay Puppy! The newest .sfs package of LibreOffice (ver. 5) will now handle MS's newest .docx format (nice one!) I only 'play around' with XP these days; I don't use it for anything serious. THAT'S where Puppy takes over. I run a 10-yr old Compaq Presario desktop (Athlon 64 X2 3800+ dual-core, 3 GB RAM in dual-channel mode, 500 GB WD SATA HDD)…..Puppy flies on this, and will give many bang up to date machines running Windows a damn good run for their money..!! I've converted a couple of my mates, too; when they saw how FAST Puppy is, they were hooked. I also have an elderly Dell Inspiron; an original 1100, from 2002…..P4, 1 GB RAM, 32 GB SSD. It's unrecognizable as the slow old S.O.B that it used to be with XP; IT flies, too..! Being an old school fix it guy that enjoys thrift shops and bringing home other people's trash, I've revived old Pentium 2 and 3 machines with hard drives as small as 20GB thanks to Puppy Linux. Granted, not the speedsters nor elegant machines of today, but functional and all that the casual e-mailer, chatter, and solitaire player needs without having to break the bank to do it. Additionally, I've revived Pentium 4 computers for people by using Linux operating systems – Puppy and Ubuntu because Winblows simply wouldn't install without crashing. If someone has a Pentium 4 or like machine and Winblows just won't reinstall, don't give up, try Puppy or Ubuntu. They've worked miracles on "dead" machines I've been referred to fix. Didn't need to install drivers, updates or figure out how to configure my network. Only issue, after 10 minutes of playing around – I don't know how to format a new hard drive so I can save my future downloads. your tutorial is very useful.Linux is awesome.i am using it for 3 years. I'm not able to watch a DVD, seems like the DVD Drive is recognized but the Mplayer and VLC player does not show the video – can you help? Can I ask have you tried more than 1 DVD to make sure that it isn't the DVD that is the issue? PrecisePup is super great. On my old laptop it does ok, better than XP did. But on an i5/8gb it was shockingly fast. Softmaker and Gimp opened as soon as I clicked on it — no wait whatsoever. It's computing like you see in movies but never see in real life — it just happens instantly. And unlike Windows or normal Linux installations, when things go wrong (and they always do at some point), you can just delete the savefile and start all over again. It may take a few minutes to set everything up the way it was before, but compare that to reformatting the hard disk, installing from DVD, installing software and then setting things up — 2 hours easy. And I don't even have to spend a few minutes setting things up; I make regular backups of my save file to another directory/memory stick. Now when things screw up, I just copy my latest saved savefile and everything is just like it was as of my last backup. Flawlessly fault-tolerant and my system is up and running in 20 seconds.